The Grand Rapids Public Museum (GRPM), a long time ArtPrize Education Days partner, is launching an exciting educational initiative, marking a new chapter in the history of their organization as well as Grand Rapids. I sat down with Rob Schuitema, Director of Education, to get the details. Becca Guyette (BG): Tell me about yourself. Rob Schuitema (RS): I work with the Grand Rapids Public Museum to design, implement, and evaluate all education opportunities at the museum, including school and public groups. I've been at the museum for 6 years. BG: Explain education programs at GRPM. RS: GRPM has been educating the public on local and world history, physical and natural science, and art and culture for over 160 years. The core of our education philosophy is based upon the idea that people of all ages and backgrounds are interested in lifelong learning, and are inherently curious. All learning starts with being curious. We create programs and experiences for early childhood learners through adulthood, with the mission to inspire passionate curiosity for the world around us. We incorporate our vast collections—over 250,000 individual artifacts—to be the primary source material that learners can interact with to enhance their experience. We offer both guided and self-guided experiences that maximize a combination of education and entertainment for guests. For our formal school programs, we incorporate State Curriculum standard philosophies and expectations to help support the curriculum goals set forth by area districts. The museum also partners with community organizations to ensure the highest quality experience of student, teacher, and chaperone. BG: I am interested in learning more about the exciting new Grand Rapids Public Museum School that opens two weeks before ArtPrize. RS: GRPM is beginning a new and exciting chapter in our storied history. Our origins are in education, starting with a partnership with GRPS over 140 years ago, and to see that partnership renewed—not only renewed but re-invented—is very exciting. The Museum is partnering with GRPS, GVSU, Kendall College of Art and Design of Ferris, the City of GR, and Downtown Grand Rapids, Inc. to open the brand new “Grand Rapids Public Museum School” this September, starting with 6th grade. The pedagogy of this school is based on a unique combination of place-based education theory anddesign thinking, matched with museum methodologies and primary source artifacts. Place-based learning and design thinking are not brand-new concepts, but by combining them—along with access to our collections as teaching tools—is something very new and fresh. Students will have the opportunity to have more creative control in how they learn about the world around them. With the time spent on reaching and implementing this model, we have seen the value in translating that to our other learning experiences. One such example is a partnership formed with ArtPrize, Carla Hartman of the Eames Office, and the GRPM in presenting the Chair Camp program. This program brings in the design expertise of Carla and the Eames family legacy—examples of Grand Rapids’ furniture heritage—and a hands-on experience challenging students to come up with their own chair creations. Design thinking has a place in every program that we offer. BG: Explain GRPM ArtPrize Education Days programs. RS: The GRPM has been a part of Education Days since its inception in the inaugural ArtPrize competition. As a cultural institution, we felt our education philosophy, institutional mission, and brand were in line with the goals of ArtPrize and wanted to be a part of this phenomenal program. The opportunity to connect with thousands of area students and teachers was one we could not pass on. This year we are working with a local artist, Cara O’Brien from Whitehall, MI. 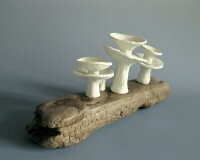 Carla works with found objects such as driftwood, logs, branches—even old furniture—and infuses small clay pinch pots to create a new narrative for the found object. The program she has created will challenge students to collaborate on making a textured sculptural piece that will be used in a tower. Students will be asked to think about how objects change as individual pieces become part of a larger collaboration. BG: What other organizations does GRPM work with in Grand Rapids? Watershed Exhibit Design Team. Collaborators included: GRPM, Groundswell, Michigan Department of Natural Resources, Grand Valley Metro Council’s Lower Grand River Organization of Watersheds, and Grand Rapids Whitewater. BG: What are you excited about for ArtPrize Seven? RS: I love the atmosphere and vibrancy of downtown during ArtPrize. We feel the energy of the crowds and the conversations in full force here at the GRPM because of our location and the work we have on display. I also relish in the opportunity to work with individual artists to create not only great art but programming that opens eyes to many students who may not otherwise have this type of opportunity. We see people from all over the state, and outside of the state, and they are here to experience art and the City of Grand Rapids and I’m honored to be a part of it. The GRPM is also pleased to have two major exhibitions at our location during ArtPrize this year as well. The Discovery of King Tut will be at the GRPM during ArtPrize, and we are opening a brand new exhibition "American Spirits: The Rise and Fall of Prohibition" on Saturday, September 26. BG: How can people connect with you and GRPM? RS: The best way to learn what’s going on at the GRPM is to visit our website at grpm.org. We are also very active on social media: Facebook, Twitter, and Instagram. If people want to keep up to date with what’s happening, they can sign up for our e-newsletter (sign up is on our website in the upper right corner), or—this is the best way—is to become a member! Members receive great benefits like free general admission, discounts, and free planetarium shows all year long. Teachers and schools can visit our website for info on all of our education programs, and sign up for our teacher club. And if you want to contact me direct, my e-mail is rschuitema@grpm.org.